PURPOSE: Our aim was to determine whether diffusion anisotropy and diffusivity of white matter tracts of the temporal stem in patients with Alzheimer (AD) can be evaluated independently by using diffusion tensor tractography. MATERIALS AND METHODS: Subjects included 15 patients with AD (11 women and 4 men; mean age, 74 years) and 15 age-matched control subjects (11 women and 4 men; mean age, 72 years). Diffusion tensor images were acquired by using echo-planar imaging. We drew tractographies of the uncinate fasciculus, inferior occipitofrontal fasciculus, and Meyer’s loop, with diffusion tensor analysis software. We measured diffusion anisotropy, diffusivity, and the number of voxels along the “tracts of interest” and used the Student t test to compare results between patients with AD and controls. RESULTS: Values of diffusion anisotropy of the bilateral uncinate fasciculus and left inferior occipitofrontal fasciculus were significantly lower for patients with AD than for controls. Also, values of diffusivity in the bilateral uncinate fasciculus were significantly greater for patients with AD than for controls. There was no significant difference in diffusion anisotropy or diffusivity along Meyer’s loop between the 2 groups. There was no significant difference in the number of voxels included in all constructed tracts between patients with AD and controls. CONCLUSION: White matter tracts of the temporal stem can be evaluated independently by using diffusion tensor tractography, which appears to be a promising technique for determining changes in white matter in degenerative diseases. The temporal stem is a white matter region that bridges the temporal lobe and frontal lobe.1 Studies indicate that Alzheimer disease (AD) is associated with changes in the white matter of the temporal stem and increased diffusivity and decreased diffusion anisotropy in the temporal stem.2,3 However, the temporal stem contains several white matter tracts, including the anterior commissure, uncinate fasciculus, inferior occipitofrontal fasciculus, and Meyer’s loop of the optic tract. Consequently, measuring diffusivity and diffusion anisotropy of these tracts by positioning the region of interest on the temporal stem produces data that are of mixed value. In the present study, to evaluate diffusivity and diffusion anisotropy of specific “tracts of interest” within the temporal stem, we used diffusion tensor tractography to delineate tracts within the temporal stem, and measured mean diffusivity and diffusion anisotropy along the tracts. The tracts of interest we chose for evaluation were the uncinate fasciculus, inferior occipitofrontal fasciculus, and Meyer’s loop. The uncinate fasciculus is believed to play a role in cognitive and memory function. Although the functional significance of the inferior occipitofrontal fasciculus is not well understood, it is believed to be involved in certain types of cognitive impairment.4 The hypotheses of the present study were as follows: connectivity of white matter tracts (which is associated with cognitive function) is impaired in cases of AD; changes in diffusion anisotropy and diffusivity of the tract of interest can be effectively evaluated by diffusion tensor analysis; and the Meyer’s loop, which was included as a control, is not affected by the changes in white matter that are associated with AD. The subjects of this prospective study were patients with AD and age-matched controls. Nineteen patients who were clinically diagnosed with AD underwent MR imaging examinations. Clinical diagnoses of AD were based on DSM-IV criteria and examination of cognitive status. Informed consent for the imaging study was obtained from all patients or their families after the nature of the procedures had been fully explained. After the imaging examination, patients with unsatisfactory diffusion tensor results due to artifacts from patient motion or metallic dental implants were excluded from the study population (3 patients). Patients with cortical infarctions on T2-weighted images were also excluded (1 patient), whereas patients with small lacunae in white matter (<5 lesions on T2-weighted images) were included. Thus, a total of 15 patients with AD (11 women and 4 men) were included in the study. They ranged in age from 63 to 87 years (mean, 74 years) (Table 1). Fifteen age-matched controls (11 women and 4 men) were included, and they underwent the same imaging examination as the patients with AD. They ranged in age from 62 to 81 years (mean age, 72 years). The control group did not include patients with dementia or cortical infarctions on T2-weighted images. The clinical status of the control group was as follows: 5 patients with small acoustic neurinoma (<1 cm in diameter) and 10 patients undergoing a screening examination for metastatic brain tumor (no tumors were observed on MR images). The cognitive status of each patient was evaluated by using a Mini-Mental State Examination (MMSE) (Table 1). Twelve of the patients with AD also underwent examinations using the Alzheimer Disease Assessment Scale (ADAS). The MMSE scores of the patients with AD ranged from 4 to 22 (mean, 15.0), and the ADAS scores ranged from 15.0 to 59.7 (mean, 27.8). 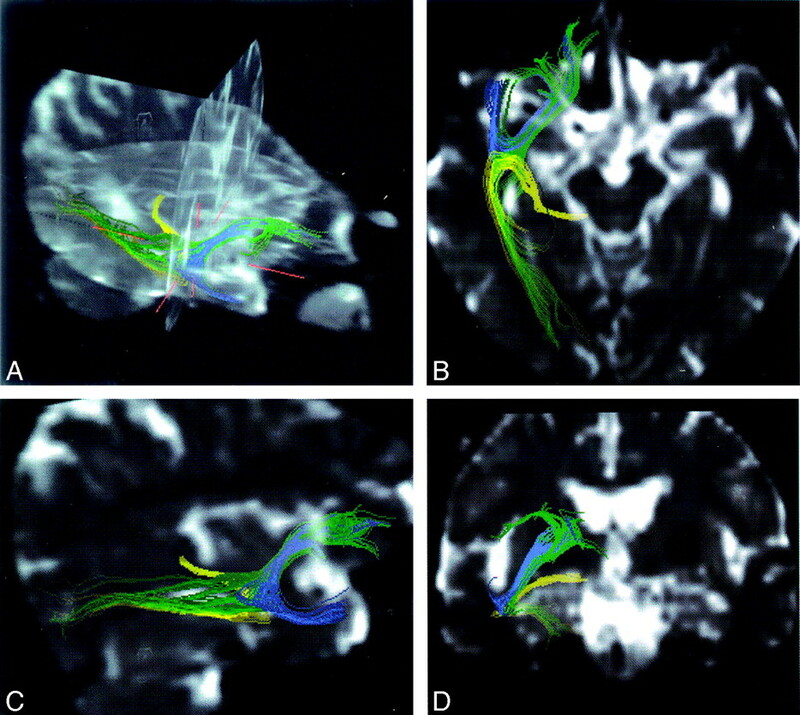 A 1.5T clinical MR unit (Magnetom Sonata, Siemens, Erlangen, Germany) was used to obtain diffusion tensor images. Diffusion-weighted images were obtained by using echo-planar imaging (EPI, TR/TE, 2300/122 ms; b = 1000 seconds/mm2; 6-axis encoding; field of view (FOV), 230 mm; matrix, 128 × 128; section spacing, 3.3 mm; section thickness, 3 mm; averaging, 6). We obtained 35 section images, covering the entire brain. We also acquired regular structural T1-weighted (spin-echo; TR/TE, 500/20) and T2-weighted (turbo spin-echo; TR/TE, 3000/105) images. Diffusion tensors were computed and fiber-tract maps were created by using a PC workstation with “dTV II” diffusion tensor imaging software developed by Masutani et al5 (University of Tokyo, diffusion tensor visualizer, version 2, available at http://www.ut-radiology.umin.jp/people/masutani/dTV.htm).6 Interpolation along the z-axis was performed to obtain isotropic data (voxel size, 0.89 × 0.89 × 0.89 mm). The eigenvector associated with the largest eigenvalue or the principal axis was assumed to represent the local fiber direction. The tracking algorithm moved along the principal axis. The diffusion tensor at the next location was determined from the adjacent voxels, and its principal axis was subsequently estimated. Tracking lines were traced in this way and were propagated in antegrade and retrograde directions until the fractional anisotropy (FA) fell below an assigned threshold. FA threshold for tracking was set at 0.18, and stop length was set at 160 steps. Tractographies of the uncinate fasciculus (blue in Fig 1) were obtained with the seed area in the white matter of the frontal lobe on coronal planes at the tip of the frontal horn of the lateral ventricle and with the target area in white matter on coronal planes at the tip of the inferior horn of the lateral ventricle in the ipsilateral temporal tip. Similarly, tractographies of the inferior occipitofrontal fasciculus (green in Fig 1) were obtained with the same seed area as the uncinate fasciculus and with the target area in the ipsilateral sagittal stratum on coronal planes at the level of the trigone. Tractographies of Meyer’s loop (yellow in Fig 1) were obtained with the seed area in the white matter anterior to the lateral geniculate body and with the same target area as the inferior occipitofrontal fasciculus. The dTV II software has a function that calculates the mean FA and the apparent diffusion coefficient (ADC, seconds per square millimeter) along the constructed tract and provides the number of voxels within the constructed tract. We measured mean FA, ADC, and the number of the voxels along the bilateral uncinate fasciculus, inferior occipitofrontal fasciculus, and Meyer’s loop. First, to evaluate interobserver variation of FA, ADC, and the number of voxels within the constructed tracts, 2 neuroradiologists independently measured the values for the uncinate fasciculus, inferior occipitofrontal fasciculus, and Meyer’s loop on both sides for 5 patients with AD and 5 controls. Correlation coefficients were evaluated between these 2 observers. Also, intraobserver variation was evaluated by 1 observer for the same subjects. Measurements were performed twice within a 6-month interval, and the correlation between both measurements was evaluated. Tractographies were drawn by using diffusion-weighted images (EPI imaging: TR/TE, 2300/122 ms; b = 1000 seconds/mm2; 6-axis encoding; FOV, 230 mm; matrix, 128 × 128; section spacing, 3.3 mm; section thickness, 3 mm; averaging, 6). Tractographies of the inferior occipitofrontal fasciculus (green), uncinate fasciculus (blue), and Meyer’s loop (yellow are shown). A, 3D view from the right upper; B, view from the bottom; C, view from the right; D, view from the front. Mean FA and ADC values were measured along these tracts of interest separately. We measured the FA, ADC, and the number of voxels along the bilateral uncinate fasciculus, inferior occipitofrontal fasciculus, and Meyer’s loop for all 15 patients with AD and 15 controls. The Student t test was used to compare the FA, ADC, and the number of voxels along the 3 tracts between control subjects and patients with AD. To evaluate FA and ADC of the entire white matter—to eliminate the possibility that there were diffuse and non tract-specific FA or ADC changes—we used a medical image processing software (Dr. View Linux, Asahi-Kasei information systems, Tokyo, Japan) on a Linux workstation. We segmented the white matter by using the threshold of FA = 0.3 and measured FA and ADC values of the entire white matter. The Student t test was used to compare FA and ADC values between patients with AD and the control group. Tractographies of the bilateral uncinate fasciculus could be obtained as semicircular tracts connecting the frontal lobe and temporal tip in all patients with AD and controls. Similarly, tractographies of the inferior occipitofrontal fasciculus could be obtained as a linear tract connecting the frontal lobe and the occipital lobe, and tractography of Meyer’s loop could be obtained as a U-shaped tract connecting the lateral geniculate body and the occipital lobe in all patients with AD and controls (Fig 1). Correlation coefficients between FA values by 2 observers were 0.88 for patients with AD and 0.86 for controls. For ADC values, the correlation coefficients were 0.78 for patients with AD and 0.88 for controls. For the number of voxels within constructed tracts, the correlation coefficients were 0.77 for patients with AD and 0.84 for controls. There were statistically significant correlations (P < .001) between the 2 observers for patients with AD and controls. Correlation coefficients between FA values after 2 measurements by the same observers were 0.89 for patients with AD and 0.86 for controls. For the number of voxels within constructed tracts, the correlation coefficients were 0.81 for patients with AD and 0.89 for controls. Correlation coefficients between the numbers of voxels within constructed tracts were 0.79 for patients with AD and 0.82 for controls. There were also statistically significant correlations (P < .001) between both measurements. FA and ADC values of the uncinate fasciculus, inferior occipitofrontal fasciculus, and Meyer’s loop for 15 patients with AD and 15 controls are shown in Fig 2. For patients with AD, mean FA values along the uncinate fasciculus were 0.35 (standard deviation [SD] = 0.02) on the right side and 0.34 (SD = 0.03) on the left side. For the control group, mean FA values along the uncinate fasciculus were 0.38 (SD = 0.03) on the right side and 0.37 (SD = 0.02) on the left side. On both sides of the uncinate fasciculus, patients with AD had significantly lower mean FA values (P < .01) than the control group. For patients with AD, mean ADC values along the uncinate fasciculus were 0.46 × 10−3 seconds/mm2 (SD = 0.03 ×10−3 seconds/mm2) on the right side and 0.45 × 10−3 seconds/mm2 (SD = 0.03 × 10−3 seconds/mm2) on the left side. For the control group, mean ADC values along the uncinate fasciculus were 0.43 × 10−3 seconds/mm2 (SD = 0.02 × 10−3 seconds/mm2) on the right side and 0.44 × 10−3 seconds/mm2 (SD = 0.02 × 10−3 seconds/mm2) on the left side. For patients with AD, the mean number of voxels included in the constructed tract of the uncinate fasciculus was 715.3 (SD = 206.4) on the right side and 674.8 (SD = 238.2) on the left side. For the control group, the mean number of voxels included in the uncinate fasciculus was 673.7 (SD = 299.0) on the right side and 712.3 (SD = 306.6) on the left side. On both sides of the uncinate fasciculus, there were no significant differences in the mean number of voxels between patients with AD and controls. Comparison of mean FA, ADC, and number of voxels between patients with AD and controls. The patients with AD had significantly lower mean FA than the controls at both sides of the uncinate fasciculus and at the left side of the inferior occipitofrontal fasciculus (A). The patients with AD had significantly higher mean ADC than the controls at both sides of the uncinate fasciculus and inferior occipitofrontal fasciculus (B). There were no statistically significant differences between AD and controls for the number of voxels of the 3 tracts (C). R indicates right side; L, left side. For patients with AD, mean FA values along the inferior occipitofrontal fasciculus were 0.41 (SD = 0.03) on the right side and 0.40 (SD = 0.03) on the left side. For the control group, mean FA values along the inferior occipitofrontal fasciculus were 0.43 (SD = 0.02) on the right side and 0.43 (SD = 0.02) on the left side. On both sides of the inferior occipitofrontal fasciculus, mean FA was significantly lower for the patients with AD than for the control group (P < .05). For patients with AD, mean ADC values along the inferior occipitofrontal fasciculus were 0.45 × 10−3 seconds/mm2 (SD = 0.02 × 10−3 seconds/mm2) on the right side and 0.46 × 10−3 seconds/mm2 (SD = 0.03 × 10−3 seconds/mm2) on the left side. For the control group, mean ADC values along the inferior occipitofrontal fasciculus were 0.43 × 10−3 seconds/mm2 (SD = 0.02 × 10−3 seconds/mm2) on the right side and 0.44 × 10−3 seconds/mm2 (SD = 0.02 × 10−3 seconds/mm2) on the left side. On both sides of the inferior occipitofrontal fasciculus, there was no significant difference in mean ADC between patients with AD and controls. For patients with AD, the mean number of voxels included in the constructed tract of the inferior occipitofrontal fasciculus was 2238.9 (SD = 921.2) on the right side and 2349.1 (SD = 790.2) on the left side. For the control group, the mean number of voxels included in the inferior occipitofrontal fasciculus was 2406.9 (SD = 959.5) on the right side and 2170.1 (SD = 753.5) on the left side. On both sides of the inferior occipitofrontal fasciculus, there were no significant differences in the mean number of voxels between patients with AD and controls. For patients with AD, mean FA values along Meyer’s loop were 0.42 (SD = 0.03) on the right side and 0.42 (SD = 0.03) on the left side. For the control group, mean FA values along Meyer’s loop were 0.43 (SD = 0.03) on the right side and 0.42 (SD = 0.03) on the left side. On both sides of Meyer’s loop, there was no significant difference in mean FA between patients with AD and controls. For patients with AD, mean ADC values along Meyer’s loop were 0.52 × 10−3 seconds/mm2 (SD = 0.06 × 10−3 seconds/mm2) on the right side and 0.50 × 10−3 seconds/mm2 (SD = 0.05 × 10−3 seconds/mm2) on the left side. For the control group, mean ADC values along Meyer’s loop were 0.49 × 10−3 seconds/mm2 (SD = 0.05 × 10−3 seconds/mm2) on the right side and 0.52 × 10−3 seconds/mm2 (SD = 0.07 × 10−3 seconds/mm2) on the left side. On both sides of Meyer’s loop, there was no significant difference in mean ADC between patients with AD and controls. For patients with AD, the mean number of voxels included in constructed tract of Meyer’s loop was 914.7 (SD = 347.7) on the right side and 1096.5 (SD = 339.2) on the left side. For the control group, the mean number of voxels included in Meyer’s loop was 1038.4 (SD = 323.6) on the right side and 976.8 (SD = 249.2) on the left side. On both sides of Meyer’s loop, there were no significant differences in the mean number of voxels between patients with AD and controls. FA of the entire white matter was 0.43 (SD = 0.02) in patients with AD and 0.43 (SD = 0.03) in the control group. There were no statistically significant differences between groups. ADC of the entire white matter was 0.88 × 10–3 seconds/mm2 (SD = 0.05 × 10–3 seconds/mm2) in patients with AD and 0.90 × 10–3 seconds/mm2 (SD = 0.05 × 10–3 seconds/mm2) in the control group. There were also no statistically significant differences between patients with AD and the control group. White matter loss in patients with AD has been well documented.7 In several recent studies, diffusion phenomena in the white matter of patients with AD has been measured.2,3,8–11 Most of those studies show decreased diffusion anisotropy and increased diffusivity of white matter in patients with AD. Such changes in diffusion anisotropy and diffusivity reflect decreased fiber attenuation, which can involve disruption and loss of axonal membranes or myelin.2 This decreased fiber attenuation may be secondary to the loss of neurons in the cortex. Takahashi et al10 reported that reduced FA values in the white matter of patients with AD reflected the distribution of neurofibrillary tangles, which may cause degeneration of projection fibers in the white matter. Bozzali et al9 reported that AD-associated microstructural white matter pathology involves certain white matter regions that are connected to the association cortices, such as the corpus callosum and white matter of the temporal, frontal, and parietal lobes, whereas white matter areas subserving motor or visual function are relatively unaffected by such pathology. These findings suggest that Wallerian degeneration of white matter fiber tracts secondary to neuronal loss in the associative cortex is a major contributing factor of AD-associated changes in white matter. The temporal stem is the white matter bridge connecting the frontal lobe and temporal lobe. The anterior limit of the temporal stem is the amygdaloid body, and the posterior limit is the lateral geniculate body. The temporal stem contains the anterior commissure, inferior thalamic radiation, uncinate fasciculus, posterior occipitofrontal fasciculus, and Meyer’s loop. Previous studies have shown decreased diffusion anisotropy and increased diffusivity in the temporal stem of patients with AD.2,3 In those studies, diffusion anisotropy and diffusivity were measured by positioning regions of interest in the temporal stem. Such region-of-interest studies are useful because they illustrate changes in diffusion status in the temporal stem of patients with AD, but they have certain limitations, one of which is that positioning a region of interest is a delicate procedure and reproducibility is not guaranteed unless standardization or another preparation procedure is performed. In AD, the temporal stem is frequently atrophied, and interindividual variation in the degree of atrophy increases the difficulty and delicacy of positioning of a region of interest. In addition, positioning of an identical region of interest in follow-up studies is very difficult because of the difficulty in section positioning at the time of scanning. A second limitation is that when using the region-of-interest method in an atrophied brain, the partial volume effect of CSF, which has very high diffusivity and very low diffusion anisotropy, can affect measurements, especially if the brain is significantly atrophied.17 A third limitation is that the temporal stem includes various tracts, and the region-of-interest method, therefore, cannot isolate specific tracts for analysis. The values of diffusion anisotropy and diffusivity acquired by using the region-of-interest method are summations of values for various tracts. There have been studies in which standardization methods such as Statistical Parametric Mapping (SPM) software (Wellcome Department of Cognitive Neurology, University College, London, UK) have been used for evaluation of diffusion tensor images of structural disorders such as epilepsy.18,19 However, standardization does not guarantee that identical spatial positions correspond to identical neuronal tracts, especially when there is volume loss in the focal brain. To overcome these limitations of region-of-interest methods, we used a coregistered tractography method to measure diffusion anisotropy and diffusivity of tracts of interest within the temporal stem of patients with AD. The software we used (dTV II) provides a tracking-line voxelization function, which voxelizes the tracking line of the white matter tract in the original tensor image. We can measure mean diffusion anisotropy and diffusivity of coregistered voxels along the drawn tracking lines. Using this method, we can evaluate an isolated tract separately, even within the temporal stem, which contains various fiber tracts oriented in various directions in complicated conformations and can, thus, exclude effects of adjacent tracts on the tract of interest. In the present study, in which we used the tract-of -interest method, mean FA was significantly lower for the patients with AD than for the controls at both sides of the uncinate fasciculus and at the left inferior occipitofrontal fasciculus. Also, the patients with AD had significantly higher mean ADC than the controls at the left uncinate fasciculus and right inferior occipitofrontal fasciculus. There were no significant differences in FA or ADC along Meyer’s loop. We could eliminate the possibility that there is diffuse and non tract-specific FA or ADC changes by showing that there are no significant differences in FA and ADC of the entire white matter between patients with AD and controls. We were able to decrease the arbitrariness of the positioning of regions of interest in the temporal stem, exclude the influence of the partial volume effect of CSF, and obtain tract-specific measurements of the isolated white matter tract of the temporal stem. We set the seed area and target area uniformly in this study. As a result, the interobserver and intraobserver variations are small and statistically significant agreement was shown. Another possible advantage of this method is that the FA and ADC of a tract of interest may indicate the degree of neuronal impairment in the corresponding cerebral cortex. Although the identical threshold (FA = 0.18) for tracking was used and mean FA values were higher in the control cases in some tracts, there were no statistically significant differences in the number of voxels between patients with AD and controls. This finding is likely because the mean FA values ranged from 0.3 to 0.4 for each tract, which is much larger than those of the threshold, and SDs of the FA were not >0.04. Thus, the voxel numbers included by the threshold of FA = 0.18 (ie, mean minus more than 3 SDs) did not have correlation with the mean FA of the constructed tracts. There are some possible limitations of the current study. One is our study population. The number of patients and the control group were small (n = 15). However, statistically significant differences could be shown for FA and ADC between patients with AD and controls, especially in the uncinate fasciculus. In addition, the control group findings were not prospective, and control subjects did not undergo the MMSE test. However, we carefully excluded subjects with symptoms of dementia, by examining clinical characteristics; and we also excluded subjects with any ischemic changes on T2-weighted images. In the current study, the number of voxels included in the constructed tract was not significantly different between groups, and the SD was very large. This finding may indicate that there is some instability in drawing tractography and that the constructed tract is not identical among subjects. Despite this instability in constructing the tract, FA and ADC values of the tract showed rather small SD values and stable results. Possible reasons for this discrepancy in findings are as follows: First, there are numerous fiber tracts in the real brain, and tensor tractography is one technique to extract part of them. Second, even when the constructed tract is not identical, as the tracts are extracted from another population with similar FA or ADC values, FA or ADC values in constructed or extracted tracts become stable. In conclusion, by using the present tract-of-interest method, we were able to independently evaluate white matter tracts in the temporal stem. Results showed decreased anisotropy and increased diffusivity within the uncinate fasciculus and inferior occipitofrontal fasciculus in patients with AD. Although a relationship to functional impairment, such as impaired connectivity, is not proved, this method can provide tract-specific information on anisotropy and diffusivity. The tract-of-interest method will be a promising technique for evaluating specific tracts in degenerative diseases such as AD. Accepted after revision September 29, 2005.